December 2015 Real Estate Market Analysis Numbers Are In. Thanks again To Jim Schroeder from Select Marketing for putting together his monthly analysis and allowing us to share these numbers with all of our clients. The story continues. All market segments remain strong. Not shown in all these numbers is the supply. I preformed an inventory of possible lot supply a few years back. The prediction then was that we’d run out of supply – and it’s now difficult to find lots – or bare sub-dividable property. 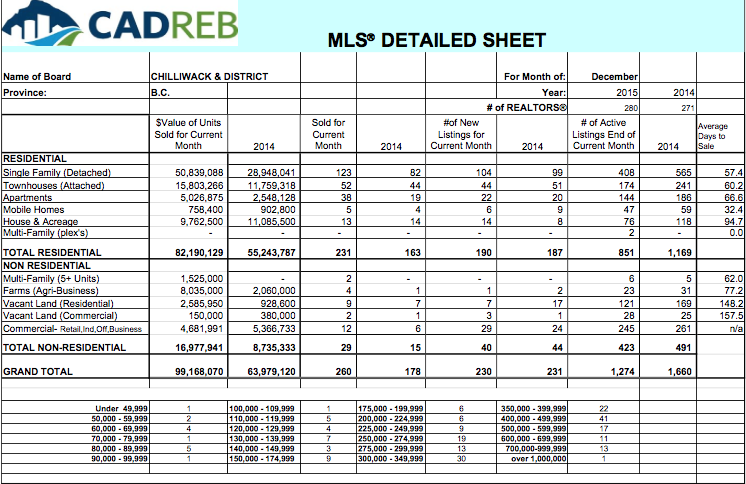 I am a Realtor in Chilliwack and refer clients to Carie. Her advise, direction, and dedication to helping us has been invaluable. Most recently, Tammy helped us purchase a new home and qualify for a new mortgage. With all the changes to regulations over the last few years, it was much more difficult than when we first bought property 15 years ago.